If you’re like me, you’ve probably become your non-outdoors oriented friends’ and colleagues first resource whenever they have questions about the best places nearby to hike and what kind of gear do they need. Climbing never seems to come up, but that’s okay. 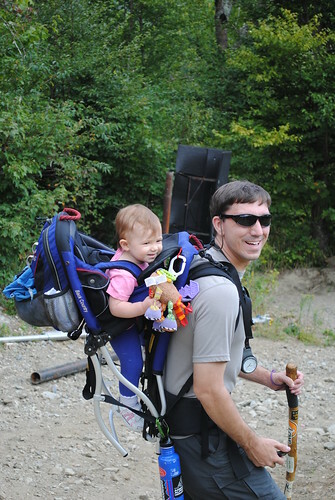 First off, the term child carrier mostly refer to something that resembles an old fashioned exterior framepack, and you don’t need a child carrier if you’re doing a short day hike with minimum gear. I used a Bjorn when Wunkerkind was an infant to walk a mile or so around Great Falls, Virginia. That’s the same device we used for a walk along the block or just to bring her along as I also put out the recycling. So if you’re using some sling or carrier now, consider whether that holder might do the trick. Second, keep in mind that the younger your child is, the further you might be able to walk with them. But once you reach toddlerhood, you don’t have to go far to share great outdoor experiences with them. 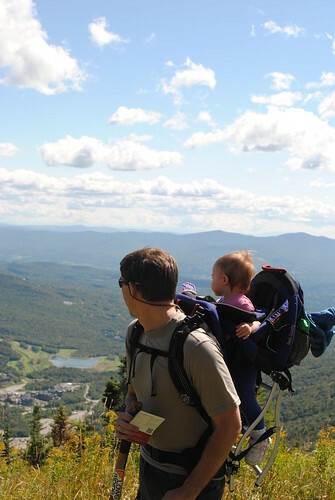 So if you’re not deadset on going on overnight backpacking trips to the Presidentials with your little one, you might not need the premier pack. Natalie and I took Wunderkind on her first “real” hikes in Vermont on Mount Mansfield (Vermont’s highest mountain, which is best known for having the biggest and best ski resort… on the east coast, that is) and around the town of Stowe last fall. She was thirteen months old so we limited the experience to one day hike on Mansfield and a couple of shorter nature walks on some secluded trails. 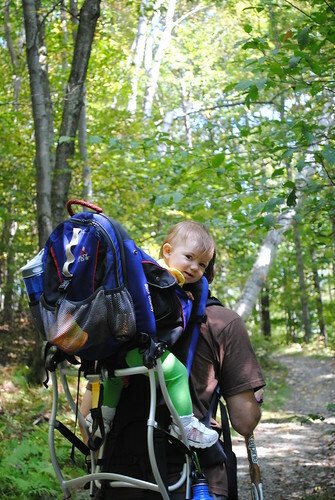 I carried Wunkerkind in a used Kelty Kids Back Country. It had a frame that hung far from my back and center of gravity, so it was a little bulky to manuever. Still, it was comfortable for Wunderkind. We used it on the “big” day hike (four miles up and down hill) and we’ve gone a lot of places on urban hikes here in Peaklessburg, like the National Zoo. Wunderkind often insists I carry her around in it even for walks to our neighborhood Starbucks. Unfortunately, the Kelty carrier recently had a mishap. A few weeks ago after a trip with Wunderkind’s mother, new brother and godparents to see the big cats and elephants at the zoo, I noticed something alarming. One of the plastic joists holding the aluminum frame together snapped beyond reasonable repair. I considered glue, duct tape, and the stress such a fix could handle. Caution made me decide that this was the end of its road. Since it was bought new in the 1990s and spent most of its life in the previous owner’s garage, it was exposed to more than a decade’s worth of Mid-Atlantic summer heat without any temperature controls. I suspect that weakened the plastic the joist was made. Combined with the increasing stress of carrying a growing Wunderkind, the weak plastic — or even the old cordura — was bound to break down eventually. Water — When trying out a child carrier in the store, especially if you have toddler, try to see where you will keep water and how you can get some to your rider. On the Kelty, I carried a Klean Kanteen off a carabiner hooked onto the webbing and can hold it over my back to just reach Wunderkind’s arm reach — she does the rest. Mirror — Also, if your child rides on your back, carry a mirror. I used the one on my compass. It allows me to check her mood, make sure she is okay, whether she fell asleep (it’s happened) or see what she’s looking at so I can keep her engaged, particularly when Wunderkind and I are walking alone. Storage — Lastly, make sure the carrier has at least a small pocket to store anything from a hat or snacks to a spare diaper. We investigated new child carriers last week and I think we settled on which one worked best for Wunderkind and me. I’ll share more about that later. I appreciate you stopping by for a read once again. If you enjoyed this post, please consider following the Suburban Mountaineer on Facebook and Twitter. Climbing matters, even though we work nine to five. Receive special announcements and other updates when you sign up on my email list. How Do You Follow and Support a SAR Thousands of Miles Away? What is International Mountain Day? Who Are You Without Mountains?